Last October we brought you news on Livescribe’s Echo Smartpen, which we said dragged the humble pen into the 21st Century. And now, with its latest release, Livescribe has gone the extra nine yards to really drag good old-fashioned pen and paper into the digital age. Just to recap, the Echo’s main raison d’être is to transform your handiwork into digital form – this could be notes from a meeting, or sketches and doodles. It works with special paper, incorporating an array of tiny dots, as well as command icons at the foot of each page. The device comes with a notebook featuring this special paper, and you can also buy more, while the built-in mic lets you upload audio to correspond with the notes you’ve taken. That’s it in nutshell, at least. Our wish is their command, and we have one of these beauties to give away…see the bottom of this post for further details. 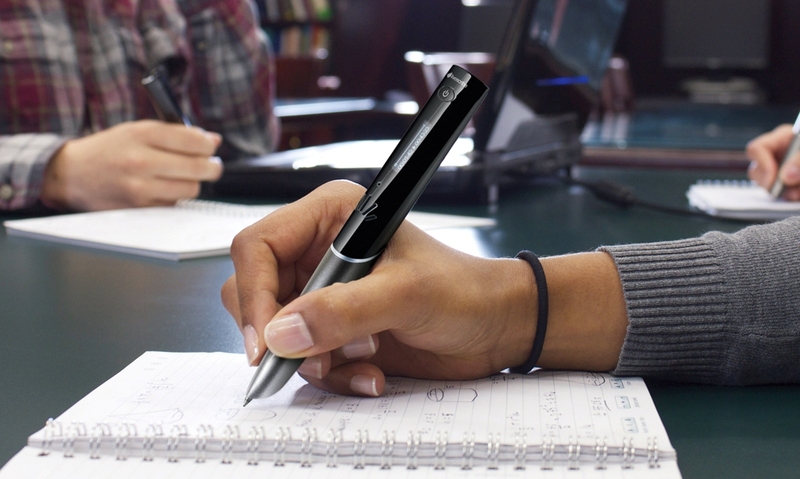 During a demo in London earlier this month, Livescribe said that its Sky WiFI Smartpen is the first digital pen to integrate WiFi and cloud services. Indeed, our first impressions were certainly positive – Sky essentially digitizes everything you write and hear, and automatically sends it to your Evernote account, from where you can play it back and associate your handwritten notes with the actual sounds you heard the second you took a specific note. However, in this day-and-age, it would be a massive benefit if it could convert handwritten notes into typed characters, to be inserted into reports etc. I wouldn’t be surprised to see some form of OCR integrated in the future. The partnership with Evernote is interesting, albeit an obvious one too, given its own endeavors in the physical media realm of late. You may remember, Evernote recently launched its Moleskine notebook, making it easier for users to transfer their penned notes to their online account. You can read our full review here. With more than forty million users, Evernote is clearly the ideal partner for Livescribe. As we noted in our review of the Echo Smartpen last year, there is a steep learning curve – you’re essentially learning to use a pen in a whole new way, and you will need to get used to this. But if you’re one, like me, who often records interviews or keynotes while also penning notes, this really could be a vital addition to your armory. If you’re one who prefers to type all your notes in real-time directly into your laptop or tablet, well, this may not be for you. The Sky WiFi Smartpen works with Evernote (free) and Evernote Premium accounts, and the pen includes an additional 500MB of monthly upload capacity (up to 70 hours of recording time) for content created with the Smartpen. It’s also worth mentioning Evernote’s developer community which already contributes apps and services to its overarching platform. Now, these same developers can also integrate content created with the Sky WiFi Smartpen into their handiwork. One notable example is Transcribe Me, an audio transcription service which taps crowdsourcing to provide audio-to-text conversion for Livescribe customers. Transcribe Me is currently developing an Evernote integration that is expected to be launched imminently. Finally, Livescribe is also announcing the pre-release of its Livescribe Mobile SDK (0.9), with limited availability starting in December. The Mobile SDK will let Sky WiFi Smartpens connect directly to tablets and smartphones through a WiFi connection. Developers can then integrate a real-time, pen-and-paper experience into their own app. So we can perhaps expect to see a slew of note-taking apps include Sky Smartpen intergration moving forward. The official version (1.0) of the Mobile SDK for iOS is planned for Q1 2013, with an Android version following in Q2. In the UK, Livescribe’s latest Smartpen is available from Amazon.co.uk, with the 2GB version (recording around 200 hours of audio) setting you back £159.99, while the 4GB version will be £179.99 and 8GB Smartpen propack, which includes Livescribe’s smartpen portfolio and a one-year subscription to Evernote Premium, costs £224.99. In the US, the corresponding prices are $169.95 (2GB), $199.95 (4GB) and $249.95 (8GB propack). It’s worth noting that the existing Livescribe Echo 2GB wired version is still available to purchase too, for a slightly cheaper price. Meanwhile, if you’d like to win one of these new Smartpens, you can enter our competition below. It’s available to readers globally, and entries will close at 12PM (GMT-8.00) on November 12. Good luck!